Our statistics on our Degrees awarded this year. De Sorbon® is promoting the sustainable development of our planet. The deforestation and CO2 emissions are among the major dangers for the next generations. Consequently we will curtail the usage of paper based documents and will communicate only electronically. We will accept only on line electronic payments. Our degrees and UNESCO supplements will remain on paper. From the Ecole Supérieure Robert de Sorbon®, a French registered "Etablissement d'Enseignement Supérieur Privé sans but lucratif " (Private not for profit Institution of Higher Education) that started international VAE in 2004.The institution is regulated by Title III Book VII of the Code of Education of the French Republic. It is not a public institution and does not grant "Titres et Grades Universitaires". We use our own VAE procedure to validate work experience in the following faculties: Arts & Sciences, Agriculture & Natural Resources, Business & Economics, Engineering, Human Resources, Education and Public Policy, Marine & Aerospace Studies, Theology, etc. Our degrees are: Bachelor (UNESCO-ISCED level 6), MBA, M.Sc., M.A., LL.M (UNESCO-ISCED level 7), EDBA, Ph.D., Doctor of Philosophy (UNESCO-ISCED level 8). we follow the European "Bologna Declaration" (3/5/8) system. For each major, our "VAE Jury" is made of three or more highly qualified university tenured professors.There is no need to come to France as we use the latest technologies. Fill Application file & pay the Refundable* Application (Euros 50€) in our application page for admission into the institution. (* in case of non admission). Within 21 days, your candidacy will be accepted or denied. If accepted, you will have to pay our Tuition and Degree Fees of Euros 550€ through our application page. The "Work Experience Jury" (VAE) will convene and examine your file and documents. Within 60 days, it will deliberate and give its decision. Jury members may ask you by E-mail or precision or additional documents. If granted, the institution will establish a Degree in French and a UNESCO-ISCED diploma supplement in English Due to the numerous postal problems the documents will be sent by registered post. A "bona fide" diploma may increase your social status, and is often mandatory for US immigration, licensing, education position, government-state jobs, promotions, etc. A real professional experience, at an adequate level, is more instructive than theoritical studies. Following its equivalence rules for work experience, l'Ecole Supérieure Robert de Sorbon® may bestow upon degrees/certificates at undergraduate & graduate levels in most fields of studies. We apply the well known "3 to 1 rule". i.e. 3 years of qualified work experience may be equivalent to one year of academic studies.This equivalency is also adopted by the USCIS. 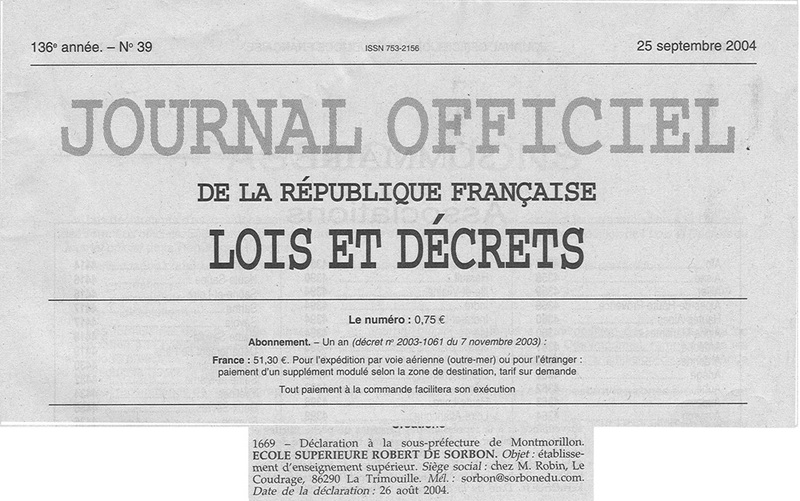 Our degrees obtained through our VAE procedure, are granted by the jury of the Ecole Supérieure Robert de Sorbon®. Those degrees are covered by the Lisbon Convention on Recognition (see art IV 8 that includes the VAE) signed by 57 countries. Our degrees are also recognized by many US Credential Evaluators for Immigration, Job Search, Licensing and University admissions. The French Ecole Supérieure Robert de Sorbon® is authorized to bestow degrees (Certificats d'Enseignement Supérieur Privé) as per L 731-14 of the code de l'Education de la République Française. It may be recognized by many independent US Credential evaluators as a foreign diploma equivalent to a regionally accredited degree of the USA. Among them: Credential Evaluation.org, CCI (Member of: NAFSA & EAIE), & one of the largest US evaluation firm AUAP Credential Evaluation Service (member American Evaluation Association),etc. 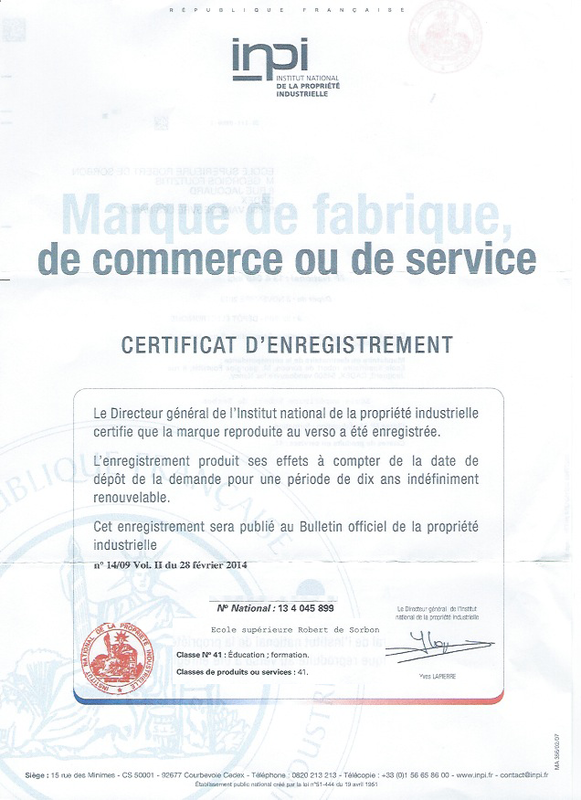 Since November 8, 2013, French authorities granted the trademark ® Ecole supérieure Robert de Sorbon® to our institution. De Sorbon® VAE juries are made of University Rectors, Head of departments and University professors that hold Ph.D. degrees from Universities like Princeton & Yale in the USA, Université de Paris II, Paris III Paris V, Paris VI , Paris VII & Paris X in France. Please read what Henry from the USA wrote to us in 2008 . "I am very pleased to inform you that I have assumed a teaching appointment at a US accredited Institution of Higher Education. I earned my M.Sc. degree from De Sorbon last year. The college has recognized my degree. The diploma is displayed in my office, and I'm very proud of it. I share and dedicate this success to all of you. Thank you once again for the great opportunity and support that you have given me to earn my M.Sc.degree". On Oct 31, 2009 G.M. from the Middle East wrote to us: " Thank you very much for the original degree certificate and I was able to get the attestation from the embassy a couple of weeks ago". On Dec. 14 2009 G.P from the Middle East send us this message:"Today I got my original degree certificate and diploma supplement legalized by the French embassy. They stamped it. Thanks to Robert vde Sorbon. Also I was elected to the IET Local network committee as the publicity officer"
Does Robert de Sorbon® deny admissions to applicants? Yes, as we are a competitive private French institution of higher education, which follows strict rules. We do not accept a simple C.V. as a valid proof of qualifying experience. Everything should be documented. It is why we ask for a refundable application fee. As our VAE based degrees are based on experience, mastering the French language is not required as we allow also applications in English, Italian Spanish & Russian. We have a rolling admission for the VAE procedure.